G1-01 What is "MOVERIO Developer Site"? The MOVERIO Developer Site offers technical information to the application software developers and is the site that offers service to upload applications to the MOVERIO Apps Market. G1-02 What is the procedure to register as a developer and upload your software application? See the following flow chart. G2-01 From which country or region can a resident register to the MOVERIO Developer Site? A resident can register in the following 52 countries and regions. G2-02 Is there a minimum age requirement when registering on the MOVERIO Developer Site? If you are legally a minor in accordance with the laws of the country or region where you reside, you must have your parent or legal guardian's permission to apply for a Developer's Account. G2-03 Can I register on the MOVERIO Developer Site as an individual? You can register on the MOVERIO Developer Site as an individual. G2-04 How much does it cost to register on the MOVERIO Developer Site? G2-05 How can I update the registered information (e-mail address, etc.) ? Information can be updated from the "profile update" screen after login. G2-06 Can I change a password given from the developer site? The password can be changed from the "profile update" screen after login. G2-07 I forgot my log-in ID and Password on the MOVERIO Developer Site. How can I recover? Please send email to following e-mail address with your registered information. G2-08 How can I stop (or restart) to receive email information about Moverio? Mail settings can be changed from the "profile update" screen after login. G2-09 How do I cancel my account of the MOVERIO Developer Site? Please send the login ID and developer name by e-mail to the following e-mail address. Once the account is cancelled, it cannot be re-activated. G3-01 Where is my Developer name listed in the MOVERIO Apps Market? Can I specify the name to be shown and/or change it? The Developer's name that is displayed in the MOVERIO Apps Market is the name the developer used to register on the MOVERIO Developer Site. Your developer name can be changed from the "profile update" screen after login. G3-02 Are there guidelines for developing MOVERIO Application Software? Yes, the guidelines appear on the MOVERIO BT-200 technical information site. Please click here. G3-03 How much does it cost to upload a software application? G3-04 How do I sell an application in the MOVERIO Apps Market? You can sell your application through the PayPal™. You will need to set up a business account with PayPal™. Japanese Developers: If you want to charge for your Products, residents or companies in Japan will need to open a PayPal™ Payment Account in Japan. To open the account, please go through the PayPal Japan website and "User Agreement for Japan users" and follow the instructions. It usually takes few weeks to open because it takes identity verification process which is required by the legal authority. https://www.paypal.com/ for details and open an account accordingly. G3-05 Can I choose if my software application is sold or if it is free of charge? You can decide at the time you upload your application. If you decide to sell the application, you will need to set up a business account with PayPal™. G3-06 What information do I need if I upload an application for sale? 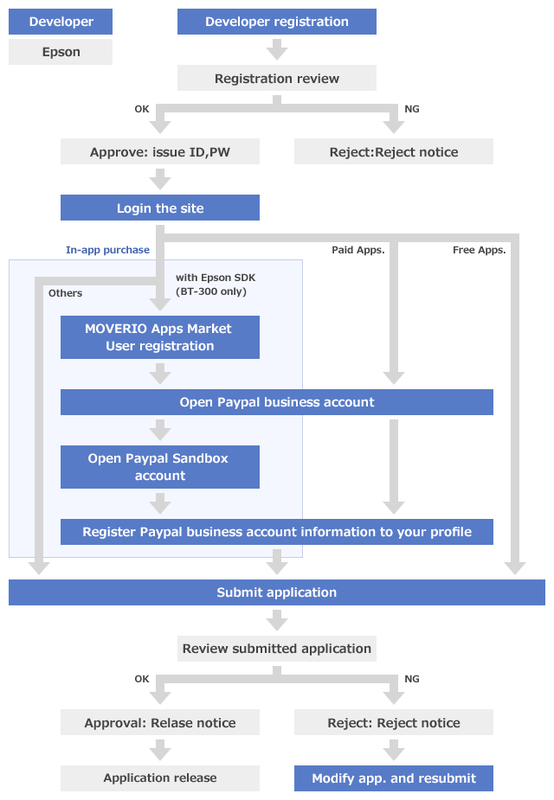 You need to set up a business account with PayPal™ and register your PayPal account on the "Profile Update" screen of the MOVERIO Developer Site. G3-07 In what currency is a Developer paid for sales? A developer specifies his currency preference from the Japanese yen, US$ or Euro. To purchase the software application, a user purchases with his local currency and PayPal™ defines the exchange rate into the Japanese yen, US$ or Euro. G3-08 Who decides the price of the application software in the MOVERIO Apps Markets? It will be set by the developer. The price should include the sales tax. MOVERIO Apps Market will charge a commission of 30%. G3-09 When are the proceeds of the software sales paid by MOVERIO Apps Market? The sales amount is added up at the end of every month Japan standard time and it will be paid at the end of month after next. G3-10 Which currency will be used for the payment? The developer will be paid in whatever he selected as his currency preference when he specified the sales price of the application. He will be paid through his PayPal™ account. The Developer can convert the currency to his own country's currency using PayPal™'s exchange rate at any time. G3-11 How can I confirm the number of software downloads? You can confirm the software download numbers by month and by country or region from "My Page". Please go to "My page"(User login required) - "Apps Development" - "Application List" - "Sales record for paid Apps"
G3-12 To which countries and regions will an application software be released? Your application can be released to following countries and regions. G3-13 Is there an user age rating of application software that can be uploaded to the MOVERIO Apps Market? Yes. Please refer to the "MOVERIO Apps Policy". G3-14 Which kind of language will be used when I register and upload a software application to the MOVERIO Apps Market? For registration, English and Japanese. For Application Software introduction, English or Japanese is mandatory. In the case of English, you can add non-English text to the description, but it cannot exceed 4000 characters including the English description. The support languages are French, German, Italian, Spanish, Portuguese, Korean, Dutch, Russian, Swedish, Norwegian, Polish, Czech, Turkish, Danish, Hungarian,Arabian, Finish, Hebraic. G3-15 Is there a size restriction when uploading apps to the MOVERIO Apps Market? Yes. 2GB is the maximum, however 256MB or less is recommended. G3-16 How is my MOVERIO Application Software examined? We will examine your application software to determine whether it complies with MOVERIO Application Development Guidelines. When you register as a MOVERIO Developer, you have access to the MOVERIO Application Development Guidelines. G3-17 My Application Software was examined and denied for uploading. Is there a procedure to inquire? Please complete the Technical Question form from "Technical Question" after you have logged in "My Page". G3-18 Can I have in-app purchasing? Yes. However, if you have in-app purchasing to your app, you need to establish your own charge system. Only for BT-300 apps, you can use in-app purchasing SDK which is provided by Epson. G3-19 Is there any retrieval function by keyword of application software in MOVERIO Apps Market? G3-20 What kind of application software can be uploaded to MOVERIO Apps Market? Please refer to MOVERIO Apps Policy. G3-21 Can we have business promotion activities in the application software? You can promote your application related advertisements. You can not have any link to other sites, images and description. G3-22 Is it possible to request a user provide personal information (birthdate, etc.) during the registration process to download the application software? It is possible. However, please be sure to explain the purpose of personal information acquisition by application software. G3-23 Can an app have a link to external web sites? No. External links in your app are prohibited. G3-24 Is the mutual link of the application software of mine to which have uploaded to the MOVERIO Apps Market permitted? G3-25 How can I stop to deliver of the applications software that you showed publicly at the MOVERIO Apps Market? Choose the "Application development" screen after you have logged in "My Page"
Select "update" button for the applicable application from an "Application List". You can Specify a distribution stop by selecting the "Cancel publish" button at the lower end of the Application Upload screen. If you want to republish the application, please select "Submit" button at the lower end of the Application Upload screen. G3-26 To which categories are the software applications assigned? Drone, Game, Entertainment, Business, Life style, Media & Video, Library & Demo, and Tools. G3-27 Can I specify the date at which the application software is available?